Dr. Joseph Meaney, Stephen Phelan and I met with Church officials and with pro-life leaders in Rome to discuss a range of concerns, primarily focusing on life and family. Renewing friendships with other leaders – and resolve in fighting for the great gifts of life and family – has a special urgency these days. Many have concerns about the direction the Extraordinary Synod on the Family took last Fall, and the confusion that was so widespread. Although there have been signs from Rome in the direction of greater clarity, many remain concerned by a phenomenon that could be called “the spirit of the Synod,” evidenced by a readiness by many inside and outside the Church to proceed with problematic proposals regarding Holy Communion for Catholics who, without having a first marriage annulled by the Church, are living in invalid civil unions; and giving some sort of blessing to homosexual unions. As many have argued forcefully, charitably and eloquently, these kinds of changes cannot receive any sort of Magisterial status in Church teaching, yet their having been raised and considered in the Synod has been taken by some as license to proceed as if they already had some kind of approval. We have seen the destruction caused by the “spirit of Vatican II”, which ignores what the Second Vatican Council documents actually said and proceeds as if the Truth is democratically decided, and there was some sort of approval granted for any change whatsoever. The clearest precedent for this confusion is certainly the chaos following Humanae vitae, which strongly affirmed unchangeable Catholic doctrine on human life and sexuality. There had been such an expectation of change created leading up to the publication of the document that, when it was issued by Blessed Pope Paul VI, a revolt ensued, leaving a trail of destruction both inside and outside the Church. Yet, God’s Grace remains available to all who turn to Him, and His hand is evident as we proceed through the present confusion. At the conclusion of the Extraordinary Synod last Fall was the beatification of Blessed Paul VI, which to those who see spiritually was a welcome, providential sign that the innovators would not have the final say on how our beloved Church defines the sacrament of marriage. Cardinals Burke, Mueller, Napier and several others made powerful interventions affirming the truth about marriage and the Eucharist – and their number has only increased since the last synod meeting. Further, we have to remember that “the spirit” is not the Spirit, the third Person of the Holy Trinity who continues to guide His Church today. The former “spirit” is a mere will to power, an adolescent demand that one’s own preferences be blessed in the name of a false compassion and mercy divorced from Truth. The need for prayer and fasting for the Holy Father and the Church is extremely urgent – as it always has been! Please also join us in prayers that the fruits of the various meetings over this last week will lead to effective action that will support the truth about life and family all over the world. We’ve seen all too well what happens when the “spirit” of the age holds sway, leading many away from Christ. We’ve also seen the joy that follows from Remaining in the Truth of Christ, toward which we direct all of our efforts. 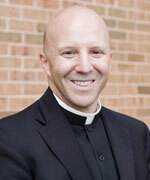 Father Shenan J. Boquet is the President of Human Life International. He has traveled around the world spreading the Gospel of Life. Father Boquet is a priest of the Houma-Thibodaux Roman Catholic Diocese in Louisiana, his home state, where he served before joining Human Life International in August 2011.